"Our facilitator really tuned into the team dynamics and made some good recommendations." Bring your team together for team building and corporate training in this beautiful waterfront city in the heart of coastal Virginia. Centrally located on the Eastern Seaboard, and situated at the confluence of the Atlantic Ocean, Chesapeake Bay, and numerous rivers, Norfolk offers convenience surrounded by beautiful waterfront and steeped in naval and colonial history. Norfolk’s many waterways and naval and maritime history sets the perfect stage for our Build a Boat program. 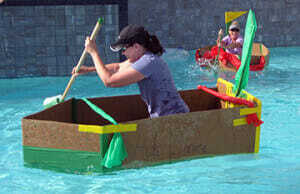 Small teams collaborate to build sea worthy vessels using only cardboard, duct tape and nylon sheeting. Soak up some sun as you and your coworkers practice innovation and strategic-thinking skills to create top-secret boat designs. Take your inspiration from naval ships, fishing boats, and recreational boats that travel the waterways around Norfolk. The final unveiling reveals kayaks, canoes, and sailboats that can withstand the Chesapeake’s chop or the tranquil waters of your hotel pool. Cheers from team members buoy the captains as they try to safely guide their boat across the finish line before heading out on the town in the historic Ghent district for a final celebration of team work. The portability of this highly interactive team building activity lends itself to some of the most scenic venues in Norfolk. Consider launching your creations from Community Beach Park or into the swimming pool at the Norfolk Waterside Marriott. Shake things up with our Countdown team building program in a local park like Town Point Park along the Elizabeth River. Small teams rotate through a series of challenges similar to NBC’s Minute-To-Win-It, practicing concentration, a steady hand, visual memory or quick eye-hand coordination. Build on this self-exploration theme with a Team Identification workshop at a hotel like the Sheraton Norfolk Waterside to empower your team with a clear understanding of who they are and where they are on the continuum from pseudo-team to a high performing team.